We have been eagerly awaiting the release of a new book — The Amazon Below Water, by Oliver Lucanus — and here it is! Oliver Lucanus is known world-wide as a fish collector, exporter and photographer, and has reported on and filmed in amazing places in South America and Africa. It seems fitting therefore that he should put together books detailing pictures from those trips — and the first focuses on the Amazon. It’s a weighty hardback of 346 pages and I’m guessing it contains some 1,000 photographs. Many of the Amazon’s habitats are featured, from shallow streams to blackwater and wide river channels, and many fish known to us, though not previously photographed underwater, are pictured in their natural habitat. For the natural aquarium and biotope enthusiast this book has serious eye candy: from Rummynose, angelfish and Discus to arowana, wolf fish, stingrays and hundreds of other species. Also captured are aquatic plants, birds, mammals and amphibians as well as the local people following their way of life. Every aspect of the unique Amazonian experience is illustrated. I often think that as a fishkeeper you can’t beat what nature provides and some of the images demonstrate that perfectly with planted riverbeds looking like the world’s best nature aquariums and shoals of fish interacting. They outdo all the freshwater aquariums I’ve yet seen! I’m lucky enough to have visited part of the Amazon and was immediately reminded how magical it is the first time you lower your head underwater — scary too. Don’t forget that while hunting fish other creatures, likethe Black caiman, may just be hunting you. Being a picture-led book the quality of the images and their subject matter is everything, and you can tell that the fishkeeper in Oliver has presented us with an aquarist’s eye view of the river. Being a magazine publishing company we have several professional photographers on site and all were keen to have a look at this book. Many of them do underwater shots for our angling magazines and "could be done better" was the consensus of some. However, I know first hand just how difficult it is to even get near a fish in the wild, let alone battle conditions like murky water. Oliver states how and why he shot the photographs as he did, the intention being that it would portray how the human eye would see it. I’ll go along with that, as it feels with some of the images that you are right there with your snorkle mask on! It’s nice to just sit back and thumb your way through this book. Some would describe it as a great coffee table read, though I would read it in bed, at work and anywhere else when I got a free moment. 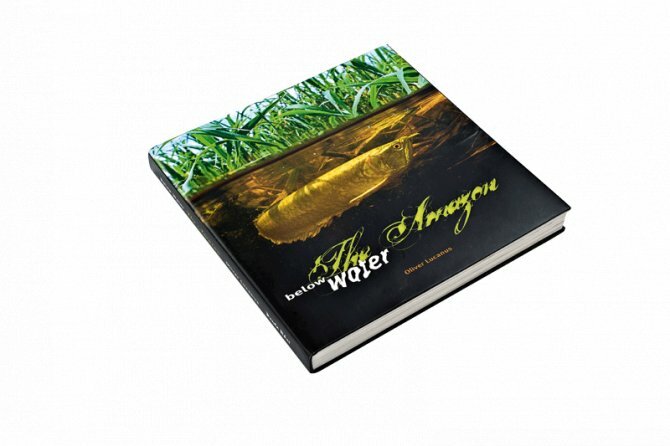 If you seek inspiration for your next naturalistic biotope or planted tank this is the book for you. Oliver has done all the hard work for you. After reading it, I bet you’ll admit to not knowing that the Amazonian habitats were so diverse and, if keeping marines, this book may just be enough to make you swing back to the fresher side of fishkeeping. Recommended!